In this meatless rendition, cook an entire bulb of garlic with the potatoes, either in a steamer or Instant Pot pressure cooker. The potatoes and garlic practically fall apart and the garlic mellows so its presence is practically undetectable. With olive oil, salt, and some of the cooking water, they easily mash into smooth, creamy potatoes. Tofu trades in as the “meat” in this vegan interpretation of classic British Isle pie. Little ¼-inch cubes of firm tofu with a texture that resembles meat, or not. Seasoned baked tofu that you buy premade is an easy high-protein addtion to the vegetables and gravy mix. Plus, to professed tofu-haters, already seasoned and marinated savory baked tofu is an easier sell than just plain white tofu. 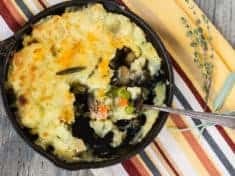 This recipe is your vegetarian shepherd’s pie blueprint–just about any stew or chili can go under mashed potatoes and make a nourishing main course meal. 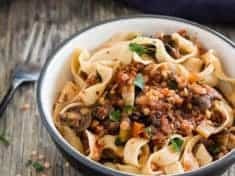 Your variation of this particular vegetarian shepherd’s pie might include beans, or lentils, or tempeh instead of tofu. Each of the three components to this dish, garlic mashed potatoes, herbed mushroom gravy, and vegetable filling, can be made ahead. So, if it’s more convenient for you, assemble the pie, refrigerate, and bake it later. 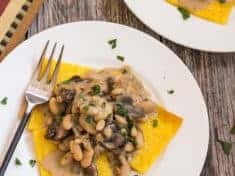 You might also want to check out this other mushroom gravy, served with baked polenta and cannellini beans. 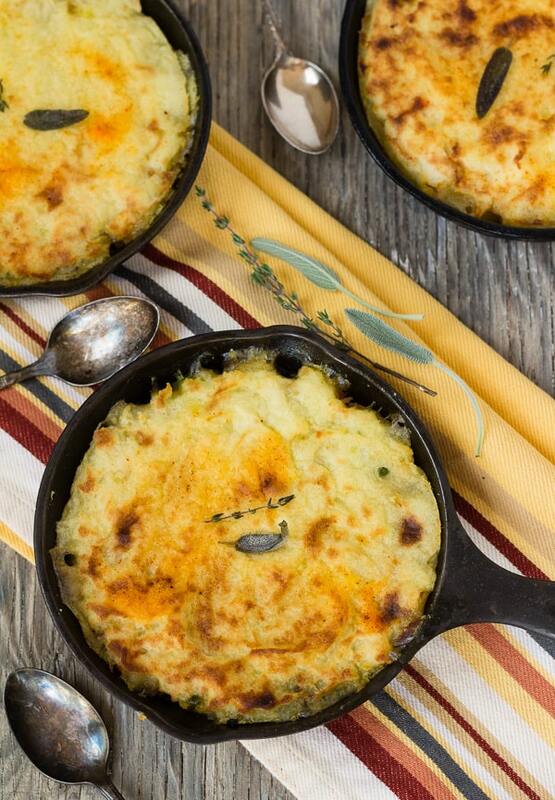 Vegan Shepherd’s Pie with Savory Mushroom Gravy is part of November’s seasonal recipe roundup. Link to Vintage Mixer’s first post this month for more recipes starring fruits and vegetables happening this month. 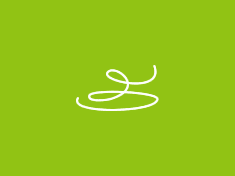 Then follow the links below to discover even more creative recipes from other bloggers. Our goal is to encourage you into the kitchen to cook something delicious—and seasonal! 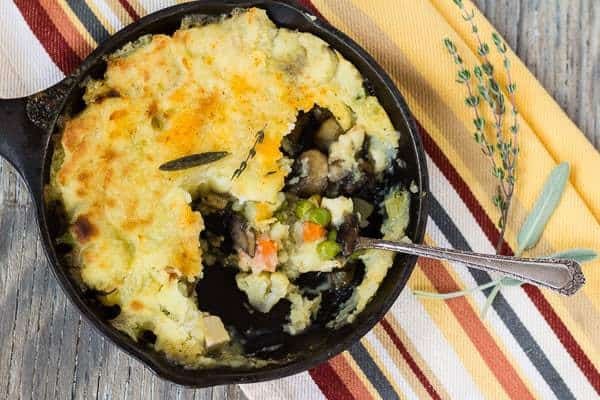 Golden potatoes baked on top of veggies in a savory mushroom gravy, this hearty vegan recipe makes one (9 x 13) casserole, or 1 (12-inch) skillet, or 6 (6-inch) skillets. Each of the three components, garlic mashed potatoes, herbed mushroom gravy, and vegetable filling, can be made ahead. If it’s more convenient for you, assemble the pie, refrigerate, and bake it later. Cut the potatoes into 1-inch pieces. Place the potatoes and garlic cloves on a steamer rack in a large saucepan. Steam about 20 to 25 minutes, until the potatoes are very tender. (My Mom always cooked her potatoes in the pressure cooker—see notes for Instant Pot pressure cooked mashed potatoes.) Remove from steamer, reserving cooking water. Mash the potatoes and garlic with the olive oil and some of the cooking water, until smooth. (see note) Season with salt. Taste, adding more salt if you think it’s needed. Set aside. Heat the oil in a large skillet on high heat. Add the mushrooms and a pinch of salt. Cook, stirring occasionally, until the mushrooms are dry and deep golden brown, about 10 minutes. 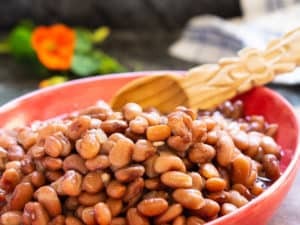 Lower the heat to medium and stir in the arrowroot or flour. Stir until the mushrooms are coated with the flour. Add the vegetable broth, stirring continuously. Add the sage, thyme, and marjoram. Season with tamari soy sauce and lemon juice. Set aside. Heat the oil in a large skillet over medium heat. Saute the onion and carrots, stirring occasionally, until the onion is translucent, about 5 minutes. Add the cauliflower and ½ cup of vegetable broth. Cover and reduce the heat; let simmer until the cauliflower is almost tender, about 10 minutes. Add the peas and tofu cubes and cook, uncovered, until the peas thaw, about 3 minutes. Stir in the mushroom gravy, tamari, and cayenne. Season to taste with salt. 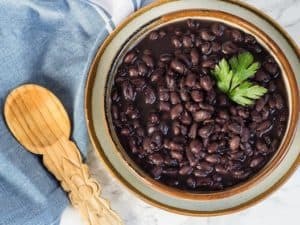 Preheat oven to 375° F. Lightly oil the serving dish: 6 (6-inch) cast iron skillets, or 1 (12-inch) cast iron skillet, or a 9 x 13-inch casserole pan. Spread the vegetables and gravy in the pan(s). Spread the mashed potatoes evenly over the veggies. (I use my fingers.) If you wish, decorate with a sage leaf and sprig of thyme. Drizzle lightly with olive oil and sprinkle with paprika. Bake about 20 minutes, until gravy bubbles around the edges. Switch the oven to broil. Broil until the potatoes are golden brown on top. For Instant Pot garlic mashed potatoes: Place the potatoes and garlic in a steamer basket in the cooking pot. Add 1 cup of water. Lock the lid in place with the vent in the sealed position. Use the manual setting and set a 7 minute cooking time. Carefully turn the vent for quick release. When the valve drops, remove the lid. Non-vegan option: Mash the potatoes with milk in place of cooking water, and butter, in place of olive oil. 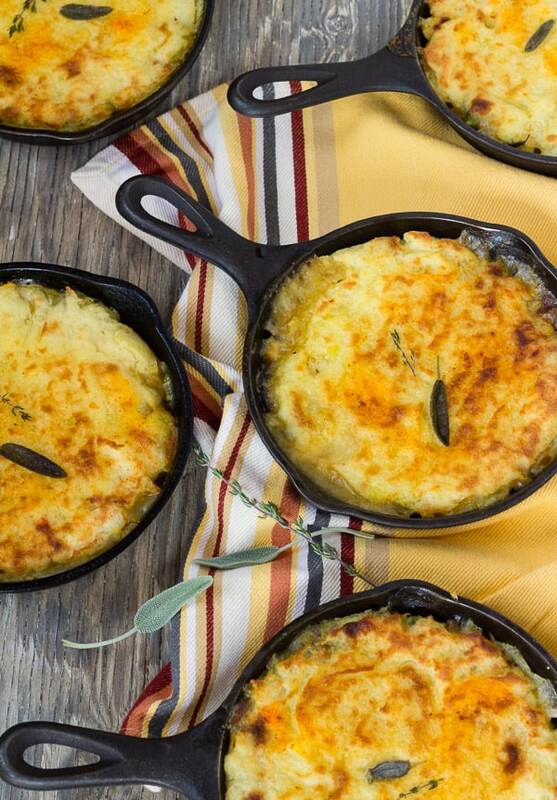 For gluten free shepherd’s pie, thicken your gravy with arrowroot or cornstarch.